Lisa takes the day off from home makeovers to join Sunset Magazine's 15th Annual Celebration Weekend! Come meet all the top editors who specialize in garden decor, cooking, and backyard plants. Lisa even gets a one-on-one cooking lesson on how to make a refreshing summer salad. 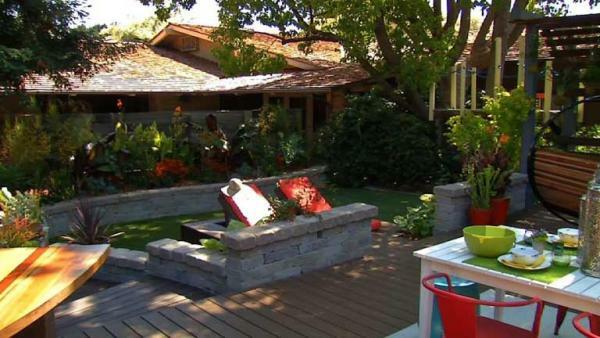 Lisa Quinn goes on a tour of Sunset Magazine's best outdoor designs of 2012. The editor-in-chief Kitty Morgan shows us how to turn your average backyard into a fresh, modern and romantic living space. Lisa Quinn gets a special cooking tutorial from Margo True, the Food Editor at Sunset Magazine. She shares some of the best tips for grilling salmon. Cucumber salads are wonderful paired with grilled foods. Serve it over salmon for a cool, crunchy contrast. Sunset Magazine showcases lots of trendy decor made out of recycled materials. Julie Chai, the Senior Garden Editor, gives us a tour of their edible plant collection. In England, Pimm's cup is a must at cricket matches. Often ginger ale is used along with or instead of the lemony soda, and sometimes a fortifying shot of gin goes in along with the Pimm's No. 1, a gin-based drink that is widely available in liquor stores in the United States. Go behind the scenes as Lisa Quinn spends a little time with the staff from Sunset Magazine.